MARK NANCE/Sun-Gazette Montoursville’s Nolan Kutney slides under Montgomery catcher Vaughan Ault to score on a single by Hunter Shearer in the fourth inning at Montoursville’s Giles Field on Saturday. Josh Burger played both shortstop and right field. He delivered a key two-strike RBI single and he added a go-ahead sacrifice fly. The Montoursville sophomore does not care where he plays and he does not care how he produces. He is the consummate team player and all the value Burger provides was evident Saturday at Giles Field as he helped the Warriors fight off a determined opponent and remain undefeated. Burger drove in two runs, including the game-winner, freshman Maddix Dalena earned his first win in relief and Logan Ott recorded a four-out save as Montoursville edged Montgomery, 4-3, in an exciting showdown between undefeated teams. The Warriors (7-0) rallied from a 3-2 fourth-inning deficit and Burger’s fifth-inning sacrifice fly scored pinch-runner CJ Signor with the go-ahead run. Burger capped a big week and finished it with seven RBIs in three games. Burger primarily was a pinch-runner last year when Montoursville captured the District 4 Class AAA championship and reached the state semifinals. He has started every game this season, excelling in all areas. He came up big in the second inning, staying with a 1-2 curveball on the outside corner, taking it the opposite way into right field and hitting an RBI single. Freshman Nolan Kutney followed with an RBI single as Montoursville went up 2-0. Three innings later, Burger came up with runners on second and third and one out. Instead of swinging for the fences, Burger stayed focused on his job, found a pitch he could hit and lofted a flyball into left field, scoring Signor and giving Montoursville a 4-3 lead. Montgomery (4-1) put two runners on with two outs in the sixth, but Ott ended that threat with a strikeout, then closed out the game in the seventh, retiring the side in order. Take away Burger’s do-your-job mentality and the outcome might have looked a lot different. The Warriors trailed for the first time all season when Montgomery scored those three fourth-inning runs and took a one-run lead. Montoursville had outscored its first six opponents, 42-6, so the challenge Montgomery provided should help it. 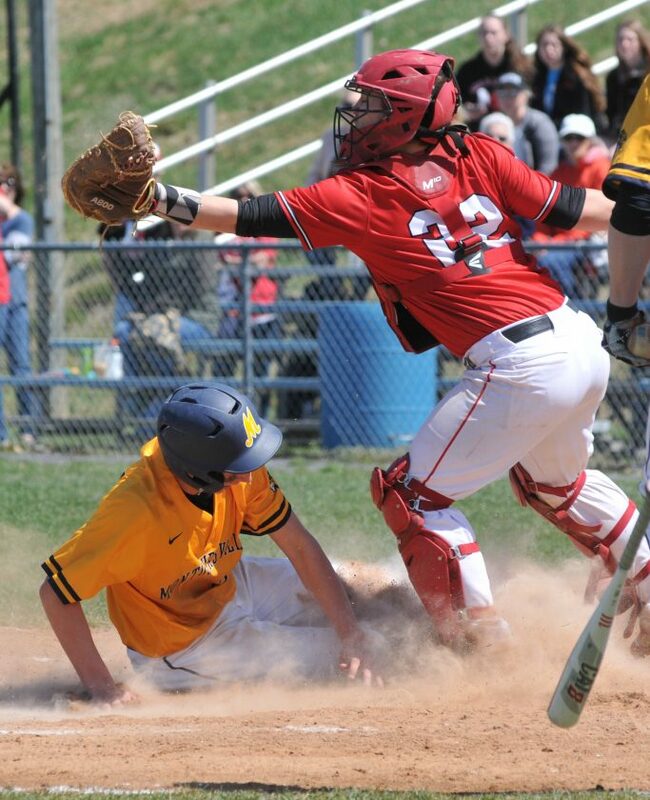 Montoursville did not panic and tied the game in the bottom of the fourth when Kutney drew a lead-off walk and scored on Hunter Shearer’s single and ensuing error. Those two were part of a bottom of the order that flourished all afternoon. Montoursville’s Nos. 7-9 hitters went 4 for 6 with two RBIs, two walks and two runs. Dalena hit a one-out infield single and Dylan Moll followed with a single, setting the stage for Burger’s sacrifice fly. Montgomery sure made an impressive statement in defeat. The Raiders went toe-to-toe with an outstanding Class AAA team, fought back from a 2-0 deficit and nearly pulled the upset. Brayden Strouse, Trevor Miller and Steven Prince all threw well and Gage Yohn saved a sixth-inning run from scoring with a diving stop that kept Moll’s single in the infield. Strouse left five runners on base in his three innings and Miller and Prince left one each on base in each of the following three innings. Montgomery again is a serious District 4 Class A title contender and Saturday’s performance shows how dangerous it can be moving forward. So was Montgomery’s fourth-inning rally. Phillips overpowered Montgomery for three innings, but Strouse, Yohn and Miller opened the inning with walks, Strouse scoring on a wild pitch. Kalen Guyer then ripped a 3-2 pitch down the left-field line for a two-run single and gave Montgomery a 3-2 lead. Phillips fought back and stranded Guyer at third with one out, but Montgomery showed that it was not intimidated. That attitude was again prevalent in the seventh inning against Maryland-bound Ott, who has not allowed an earned run this season. Thayden Miller nearly delivered a lead-off, pinch-hit single, but second baseman Peyton Mussina made an outstanding play up the middle and prevented it. Mussina again made a good play in the hole for third out, this time going toward his left, as Montgomery truly went down swinging. Brayden Strouse, Trevor Miller (4), Steven Prince (6) and Vaughan Ault. Gabe Phillips, Maddix Dalena (5), Logan Ott (6) and Jaxon Dalena. W: M. Dalena, (1-0). L: Miller, (1-1). S: Ott, (1). Top Montgomery hitters: Strouse 2-4, run, SB; Kalen Guyer 1-3, 2 RBIs; Hayden Ross 1-2, BB. Top Montoursville hitters: Josh Burger 1-2, 2 RBIs, run; Hunter Shearer 2-3; Nolan Kutney 1-1, 2 BBs, RBI, run; M. Dalena 2-3, run; Dylan Bower 1-3, SB, BB; Dylan Moll 1-2, SB. Records: Montoursville (7-0), Montgomery (4-1).